Interstate 35 runs north and south through the west side of Ardmore, providing a major shipping artery for goods headed toward the Canadian and Mexican borders. East-west access is easy from Ardmore. Interstate 35 connects with Interstate 40 just 100 miles north in Oklahoma City. A mere 123 miles south in Dallas, Interstate 35 connects with Interstate 20. The BNSF railroad parallels Interstate 35, with a main line running to points north (Kansas City, Chicago), and south (Dallas, Houston). Ardmore has a rail switching yard and two spurs off the main BNSF line, which serve the Michelin tire plant on the west side of town and the Ardmore Industrial Airpark north of town. Commercial air service to and from the area is provided by two major airports – DFW International Airport (Dallas) and Will Rogers World Airport (Oklahoma City). 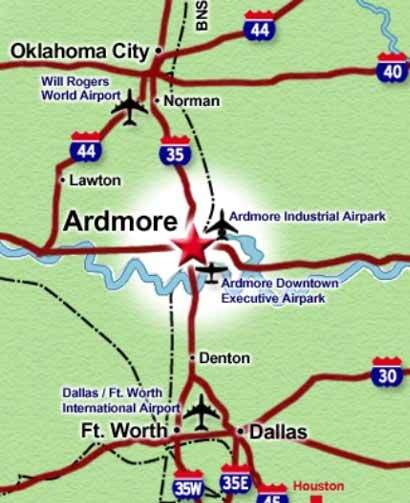 Each airport is just 90 miles/minutes from Ardmore. 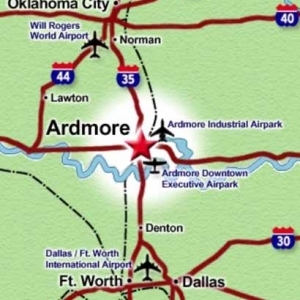 In addition to the commercial airports, Ardmore also has two general aviation airports: Ardmore Municipal Airport and the Ardmore Downtown Executive Airport. Expansions As part of a 5-year capital improvement plan, it was announced in 2018 that a new concourse will begin construction in 2019. Completion of the project should take approximately 30 months and will see the addition of four gates. 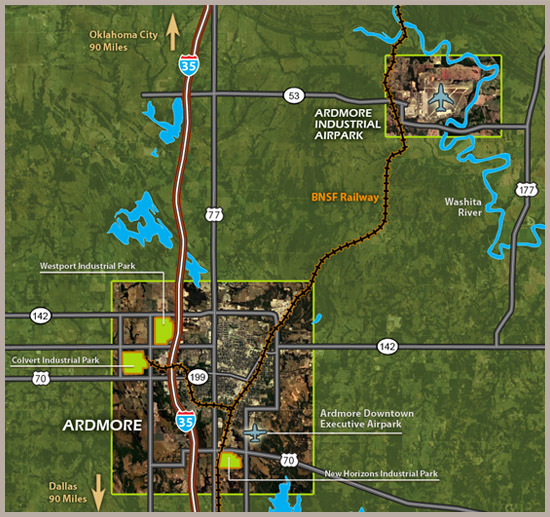 Located 16 miles northeast of the city, the Ardmore Industrial Airpark is home to the Ardmore Municipal Airport. It includes 2 runways- 9,000-feet and 5,300-feet. Runway 13-31 is long and wide enough to land large commercial jet aircraft. 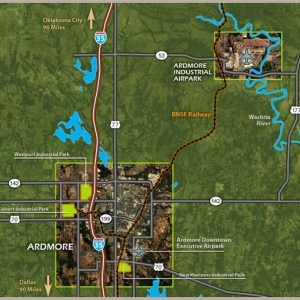 The Ardmore Municipal Airport provides an ideal setting for companies that serve the aerospace industry. Number & length of runways 2 Runways. 13-31 is 9,000 x 150 ft and 17-35 is 5,300 x 100 ft.
Full instrument landing capabilities Yes. FAA compliant. Control Tower. ARFF and security services. Hours of operation 24 hours a day - 2 FBO's on site. A convenient executive airport lies in the heart of Ardmore, offering a 5,000-foot runway for small jets and airplanes.